Speaking as someone who loves right-angle weave, cubic right-angle weave has quickly become one of my favorite off-loom beading stitches for creating 3-dimensional beaded jewelry designs. 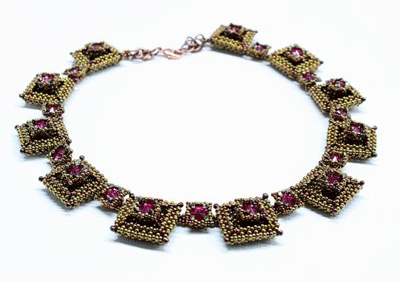 I can’t think of another beading stitch that even comes close to the versatility of cubic right-angle weave when it comes to designing and crafting intricate and innovative beaded jewelry. Want to get started learning how to bead with cubic right-angle weave? Check out four of my favorite blogs with tutorials, tips, and techniques to get you inspired! Learn Cubic Right-angle Weave, Step By Step. After I mastered the basic thread path for cubic right-angle weave, I wrote up this easy-to-follow tutorial to share. To get yourself comfortable with the thread path for cubic right-angle weave, start by using larger beads (size 8 or even size 6), and try using 3 colors to keep track of each side of your structure. Stitch Pro: 2 Ways to Work Cubic Right-angle Weave. Jean Campbell learned a thing or two about stitching with cubic right-angle weave while doing tech edits for Beadwork magazine. Once you’ve mastered the basic thread path, try an alternate thread path and see which one works better for you. 3 Tips for Better Beading with Right-angle Weave. Just like all my other favorite off-loom bead-weaving stitches, there are things you can do to get better results from your efforts with cubic right-angle weave. What is Prismatic Right-angle Weave? If you’re ready to move on and learn even more about how to use cubic-right angle weave for creating fantastic beaded structures, you’ll want to explore techniques in prismatic right-angle weave. Check out this fabulous guest blog from bead artist and Designer Of the Year Cindy Holsclaw that explains what prismatic right-angle weave is! If you’re like me, then you’re probably a visual learner, as well. I usually work best with a new beading stitch when I can watch someone demonstrate the thread path for me. And when it comes to learning the techniques of right-angle weave, I can’t think of anyone better to learn from than bead artist Marcia DeCoster! When you get your copy of Cubic Right-angle Weave: Prismatic Right-angle Weave and Embellishments with Marcia DeCoster, you’ll learn everything from the basics of cubic right-angle weave, shaping techniques, embellishment techniques, and how to take this stitch a step further to create three-dimensional geometric shapes with cubic right-angle weave. You’ll also learn Marcia’s favorite tips for choosing the right materials and beading supplies, managing your thread, and how to get the most out of your bead choices for your cubic right-angle weave projects! Have you tried cubic right-angle weave yet? It’s never too late or too early: now seems like a good time to start!